It’s been nearly a week since the announcement of the Charlotte Museum of History’s suspension of operations, and the comments that the development elicited online are worth reviewing. All of us involved in cultural heritage collections can learn something from the support as well as the criticism that online discussions express. Within a day of the report on the institution’s closure, the Charlotte Observer article received 43 responses. Several folks lamented the closing and a few wished for public funding to sustain the institution. Other responders took a firm stance that cultural institutions must be privately supported and that the worthy institutions will survive on donations and revenues or big business sponsorships. One theme various comments addressed was that the Alexander House is worth preserving–not only as the oldest local building but also as one of the few historic buildings left in the Charlotte area, which was completely transformed by urban renewal efforts during the 1970s. 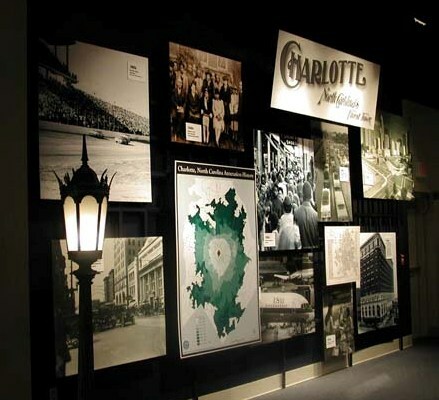 Perhaps the Charlotte Museum of History will regroup in the months ahead and transform itself into a site of community engagement. Perhaps the organization will forge partnerships with private groups that will allow tours of the Alexander House and its preservation to continue. Because most of our cultural heritage institutions–whether privately, locally, or state supported–survive precariously, whatever happens there can be instructive for us all. Squirrel shapes decorated early Moravian and other pottery styles. This Moravian bottle from the Old Salem Museum and Gardens collection is one example, likely dating to the 1830s, in the “Art in Clay” traveling exhibit. 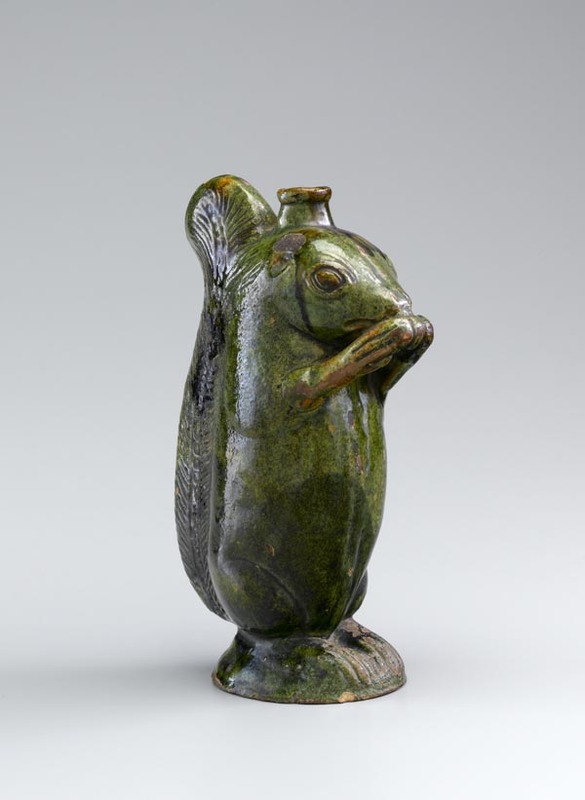 According to pottery inventories, squirrel bottles were the most popular figural bottle shape produced at Salem during the early 19th century. 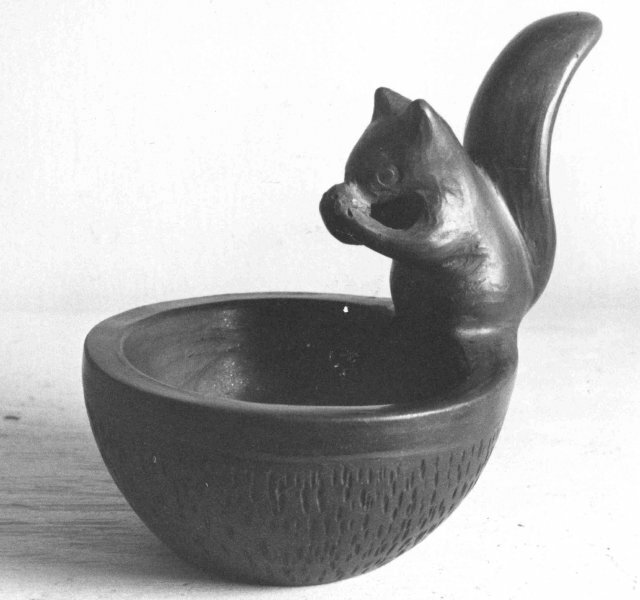 The Qualla Arts and Crafts Mutual in Cherokee preserves this Catawba-style pottery effigy bowl with a squirrel-shaped handle. Cherokee potter Rebecca Youngbird created this blackware oil lamp sometime during her productive years (1934-1979). During the final weekend in May (this weekend) the town of Brevard hosts a festival dedicated to a special type of local squirrel. White squirrels, not native to North Carolina, have been thriving in the state’s mountains since 1951, when a pet pair that a Brevard family received from a Florida friend escaped into the woods. Today white squirrels make up more than a quarter of the Brevard-area squirrel population. 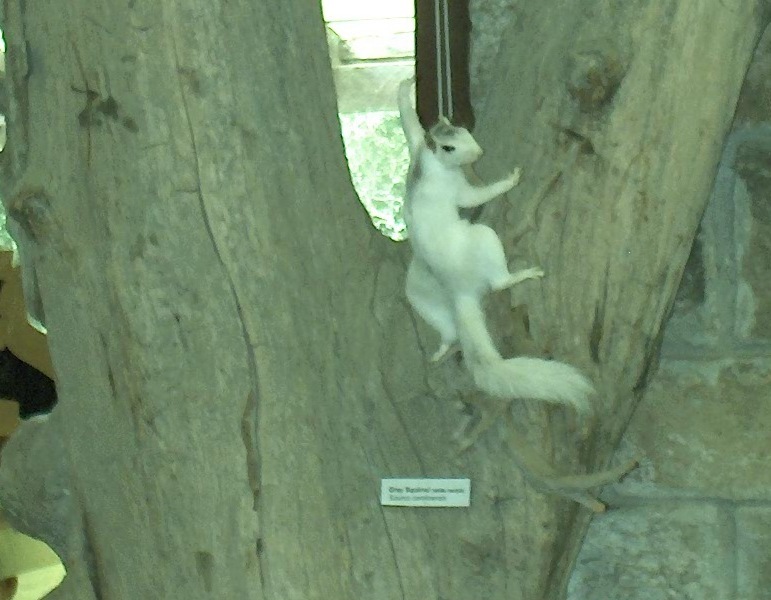 The Highlands Nature Center collection contains a taxidermed white squirrel specimen, mounted on a chestnut tree that died in the 1935 blight. Does your institution’s collection represent these state or local symbols? 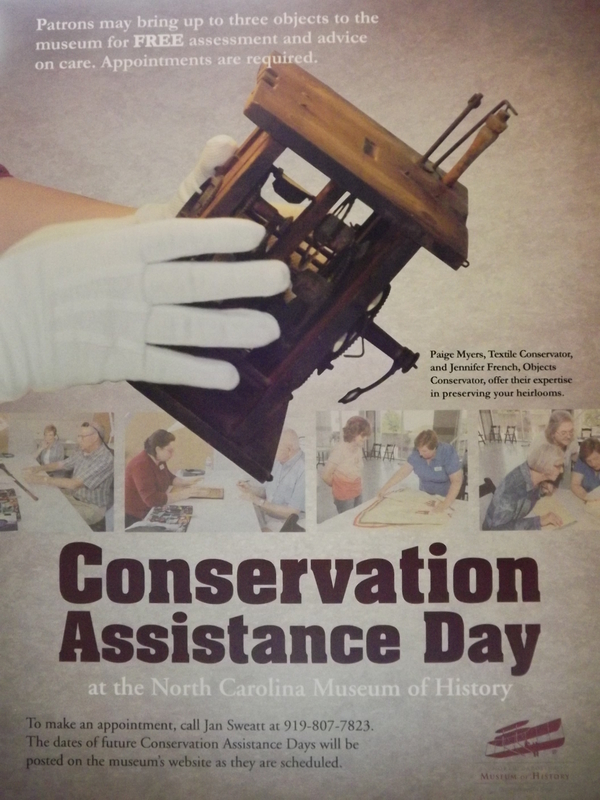 Collections staff at the North Carolina Museum of History recently inaugurated a quarterly “Conservation Assistance Day” as a public service and a way to introduce preservation concepts into the museum’s array of public programs. Here’s how it works: whenever members of the public call the museum with questions about how to care for pieces they have at home, a staff member alerts them to the quarterly Conservation Assistance Day schedule and encourages them to sign up for an appointment to meet with one of the museum’s two conservators—Textiles Conservator Paige Myers or Objects Conservator Jennifer French. Each participant can sign up for one half-hour appointment and bring up to three treasures into the museum, where collections staff have a temporary workspace set up behind glass walls, visible from the lobby. Both conservators meet with attendees who bring mixed media objects containing textile elements. In this scene, Myers and French analyze a fan. The conservators focus on identifying materials in the pieces and giving participants advice on ways to preserve their treasures. They always refer questions about monetary value to a list of qualified appraisers. One participant brought in this elaborate collage on a hand truck, secured with a bungee cord. 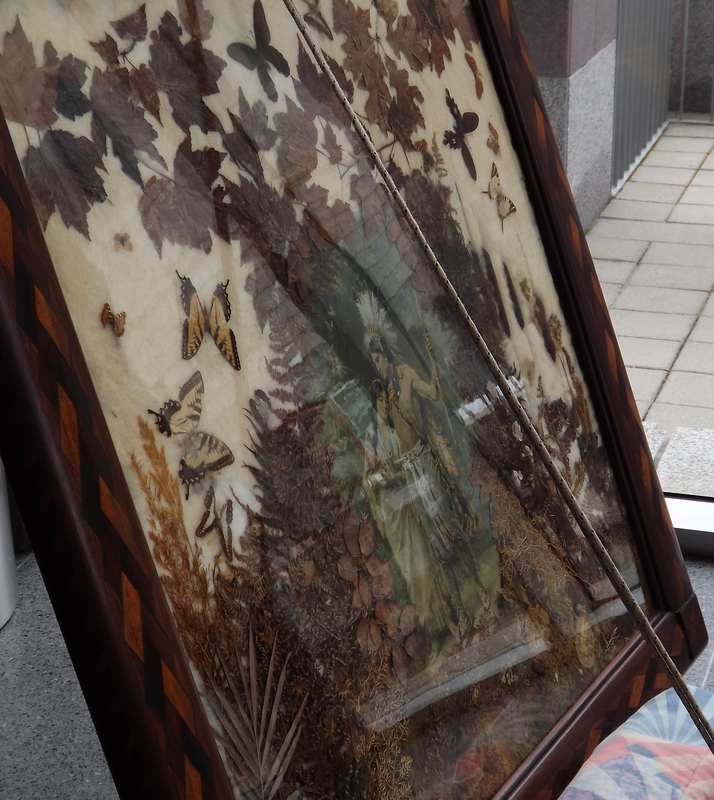 The wooden marquetry framed piece contains butterflies and dried leaves on a wool ground and likely dates to the 1880s. A print depicting an Indian warrior and maiden embracing (perhaps Hiawatha and Minnehaha) dominates the assemblage. Conservators pointed out evidence of previous insect infestations and light damage and advised the owner about climate considerations. Folks who bring their heirlooms in for consultations leave the session pleased with the free service the museum provides, and many sign up for repeat appointments. Moreover, the event generates interest among general museum visitors who can see the artifacts and ongoing staff consultations through the glass walls. Most history museums do not have conservators, but there are still ways to make the work of preservation more visible to the public. Consider setting up a temporary workstation in the lobby or main exhibit area of your institution to work on small re-housing or artifact cleaning projects. A few folding tables covered with ethafoam sheeting, muslin, or tyvek can create an easy-to-assemble work space. Be ready to explain the activity to visitors and help them understand why the artifacts need improved storage or other conditions. Information about collection dangers or the basic costs of archival storage products can be great to hand out to really curious visitors in these instances and may encourage future support of your institution’s preservation activities. 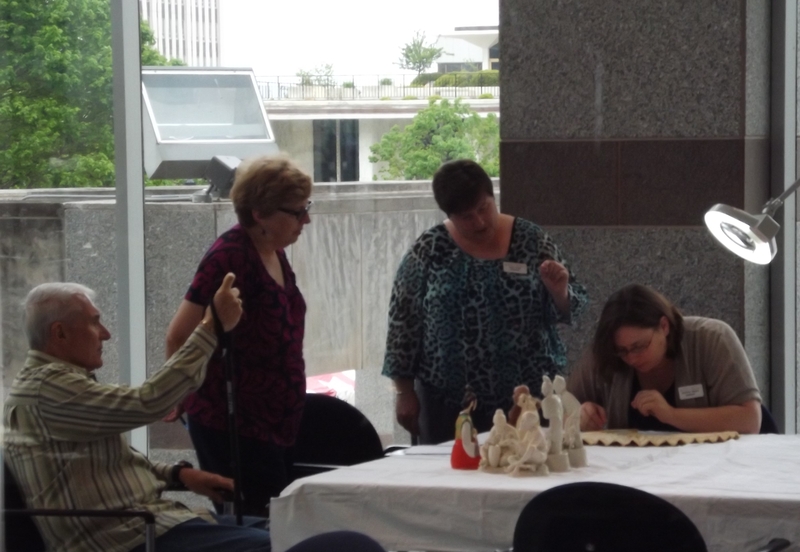 Have you ever tried bringing “behind the scenes” activities to the forefront of your museum? Besides setting up temporary workspaces and short-term preservation projects, do you have other ideas to make preservation more visible to the public? Offering visitors a view of what has typically been “behind the scenes” in museums can be a great way to pique interest in preservation and conservation. More importantly, encouraging public understanding about a museum’s responsibility to care for its collections in perpetuity can lead to more widespread support of preservation. Visible storage and visible collections work areas are ways some museums have brought the “behind the scenes” into the forefront. Visible storage can be an effective strategy to meet a museum’s dual collection imperatives—preservation and access. Several museums with large visible storage galleries report that these spaces increase visitors’ understanding of the size and scope of an institution’s collection. There are a few extra challenges, however, involved with visible storage. Visible storage is necessarily less artifact-dense than reserve (i.e. back-room) storage; one study found that visible storage has, at best, 2/3 the capacity of reserve storage to house artifacts. Artifacts in visible storage are exposed to more light than in traditional reserve storage. Textiles and paper, therefore, normally should be excluded from visible storage schemes. The quantity of objects on view in visible storage can be overwhelming to some visitors. Arranging objects according to one big idea can help. Installation of the casework necessary for visible storage can also be tremendously expensive for museums. A more budget-friendly option is to install a window through which visitors can glimpse the reserve collection and even view collections staff at work. The storage room at the recently built Graveyard of the Atlantic Museum (GOAM) in Hatteras follows this design objective, and a glass wall separates collections storage and work space from the main exhibition gallery. Museum visitors can see mobile shelving units on one side of the space and work tables on the other. Staff can arrange part of the collection on the outermost set of shelves for visible storage. Those in the exhibit gallery on the day of researcher Dawn Taylor’s visit to collections storage would have viewed this scene through the glass wall, as GOAM staffer Clara Scarborough showed Taylor artifacts on the mobile storage shelving units. What access do visitors to your institution have to collections storage? Is any part of storage visible to the casual exhibit-goer? For more information on visible storage, see John D. Hilberry, “Behind the Scenes: Strategies for Visible Storage” (Museum News, July/ August 2002) and Dee A. Stubbs-Lee, “Inside Out: A Conservator’s Investigation of Museums, Visible Storage, and the Interpretation of Conservation” (Collections: A Journal for Museums and Archives Professionals, Fall 2009). Polyethylene foam is a terrific support for fragile objects but, as we’ve discussed in earlier posts, it is often pricey. In some cases, swimming pool noodles and pipe insulation can be safe alternatives to the ethafoam that archival suppliers sell. 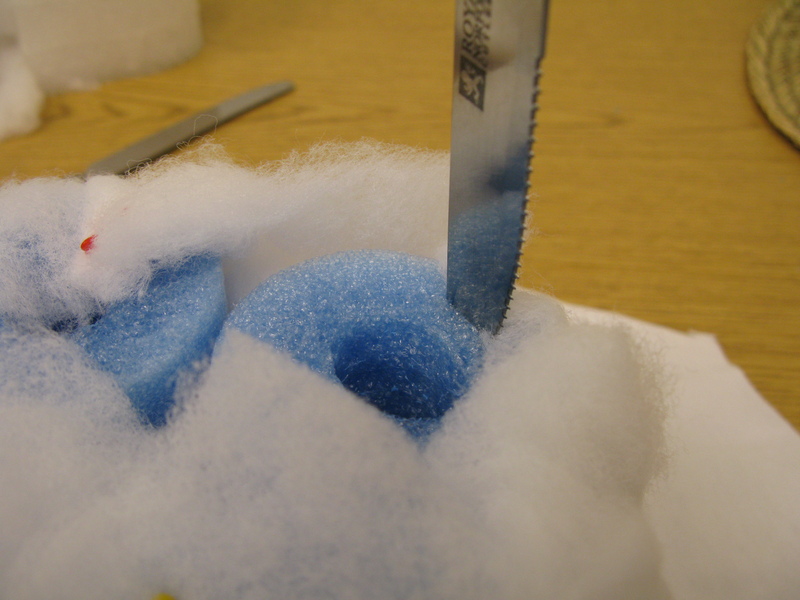 Cheap serrated knives do an adequate job cutting foam. Our staff purchased these 2 for $1 at the local dollar store. Local fabric stores carry polyester batting that works well as padding for textile artifacts. Try to find thermal-bonded, rather than resin-bonded batting. The trace resin is PVA, which is not preservation-appropriate. Washed white cotton jersey fabric is a good mount cover. 1. Cut the noodles in equal sections, long enough to support the object and keep pressure off weaker areas like the brim. 2.Tie as many sections as will fit inside the hat with cotton string or twill tape. Make sure there’s extra space left for padding without putting stress on the artifact. Cut noodle sections lengthwise, if necessary, to add or subtract to the cylinder cluster for the necessary circumference. 3. Trim the outside edges of the noodle sections to round the mount shape. 4. Stuff void areas between noodles with scraps of batting. 5. Stretch one or more layers of batting over the foam base. Pin on the underside. Quilters pins do the job, but ones with tall flat heads (butterfly or flower shaped) are even easier to pull out of the foam when the time comes. 6. Stretch a piece of cotton jersey over the batting layer(s). Before attaching, feather/ taper the ends of the batting by pulling the end fibers apart. This step keeps the base of the mount as flat as possible. 7. 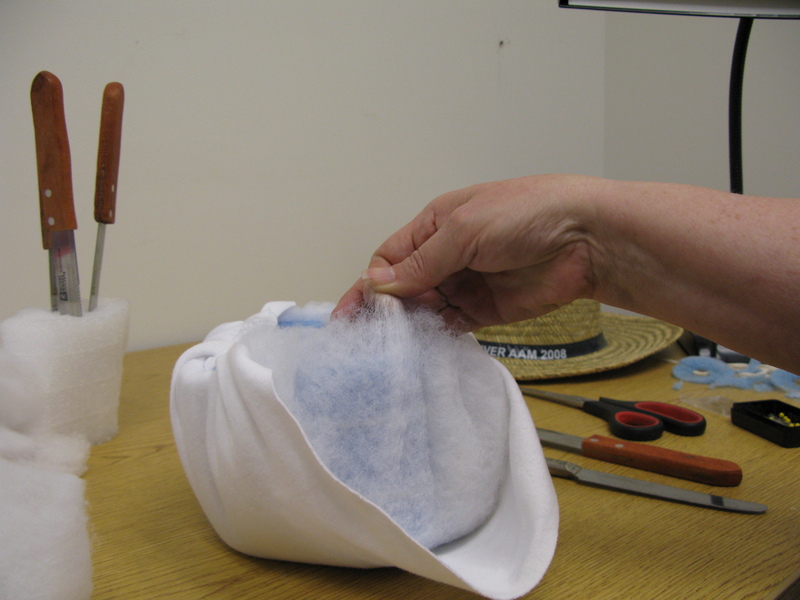 Choose a method to attach the jersey fabric to the foam–either with low-melt acid-free glue, by stitching, or by cutting slits into the foam and pressing the fabric into the slits with a bone folder. Pull pins out before attaching. 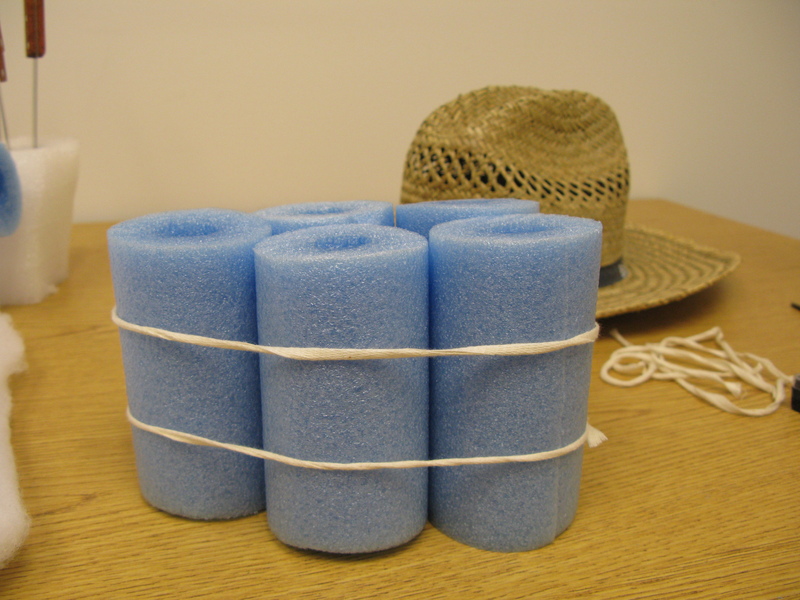 At the end of this mount-making experiment, Martha concluded that the pool noodle method probably saved $1-$1.50 in foam costs for a single hat mount. It was somewhat more troublesome to size and arrange and resulted in a lumpier finished product. The finished mount was serviceable, and pool noodles would be worthwhile for mount projects, if an institution only had a few to build and did not maintain a supply of ethafoam. Another inexpensive hat mount is the kind that Gaylord now sells made out of blueboard. 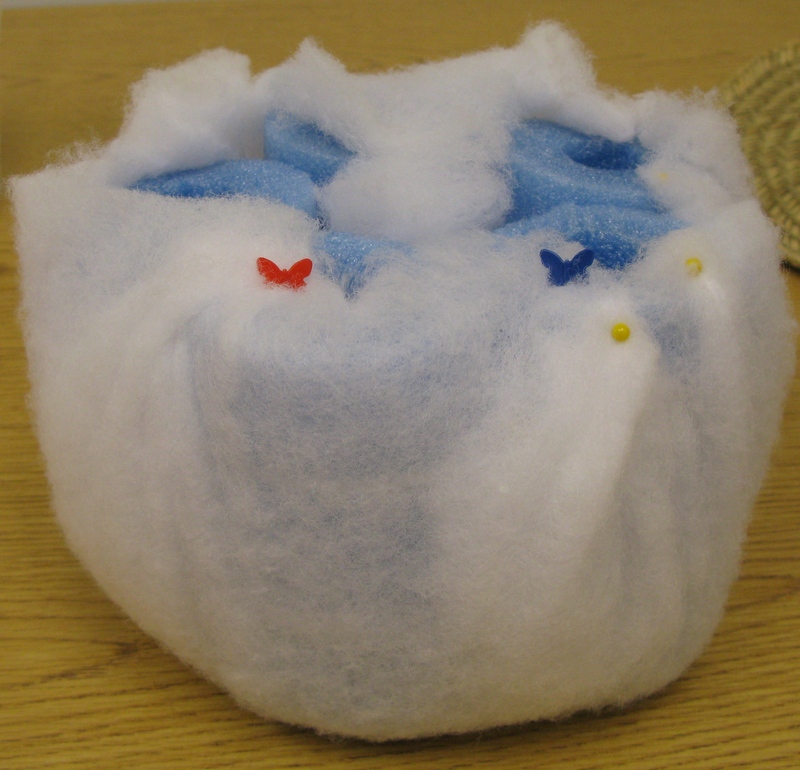 Paige Myers demonstrated how this can be combined with a half-section of pool noodle, sliced on four sides to cushion and build up the top of the blueboard mount. 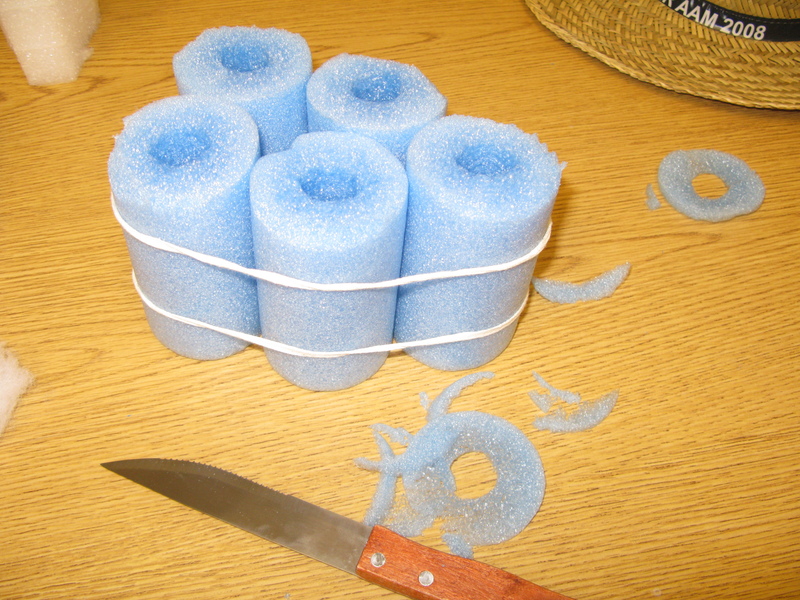 Pool noodles have been used more successfully as bases for rolled storage. They work well for moderately sized, light-weight fabrics such as crib sheets or some table coverings. A supporting rod slips easily through the hollow center. Some institutions also use them to make padded hangers. Illinois’ C2C program recently posted a webinar where two professionals discussed a variety of money-saving preservation strategies, including the use of pool noodles. Have you tried pool noodles for collections storage? If not, dive in and see what you can come up with. Can you suggest any other low-cost materials for preservation? If so, please share your tips! Appearing in Paul Green’s 1937-38 production of “The Lost Colony,” these actresses represented Eleanor White Dare and Virginia Dare. Virginia Dare became iconic in North Carolina and beyond as the first baby born to English parents in America. 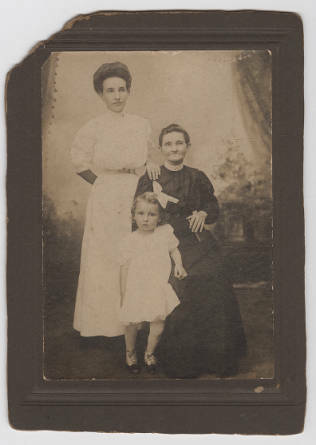 A cabinet card photograph commemorates Ann Alberta Mortenson Mitzen’s relationship with her mother and grandmother in this 1908 studio portrait. Upon Mitzen’s death in 1990, she left her estate to the Davie County Public Library in honor of her mother, Percy Joyce Nichols Mortenson, and her grandmother, Edith Ann Latham Nichols. 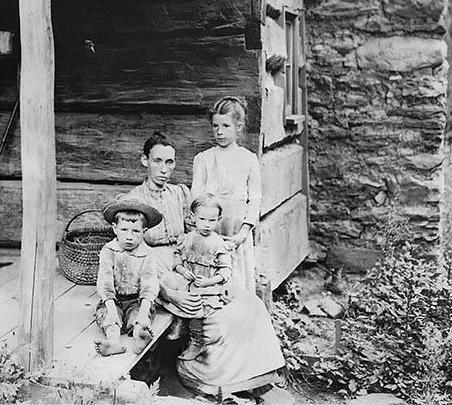 This detail of photographer Margaret Morley’s work in the North Carolina mountain region shows three children clustering around a wan-looking mother. The photograph dates to circa 1900. Just as Morley sought to document domestic conditions and familial relationships at the turn of the 20th century, Dorothea Lange created images of motherhood and rural working conditions for the Farm Security Administration more than a generation later. FSA photographs are now digitized and available online. 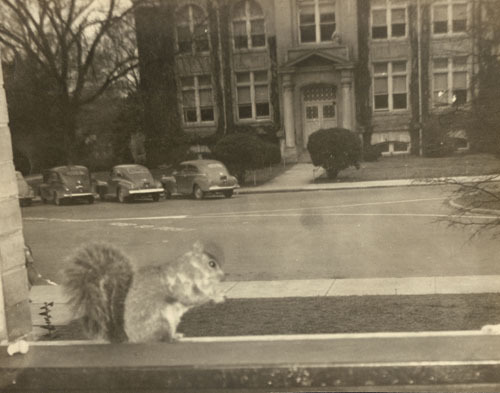 They are a rich source of North Carolina imagery from the late 1930s and early 1940s. 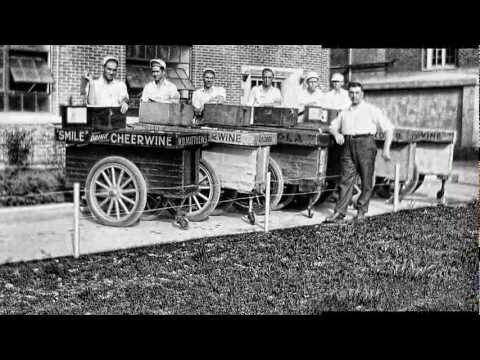 If your institution seeks to interpret this period, search the Library of Congress’ collection for documentary photographs of local life during the Depression. 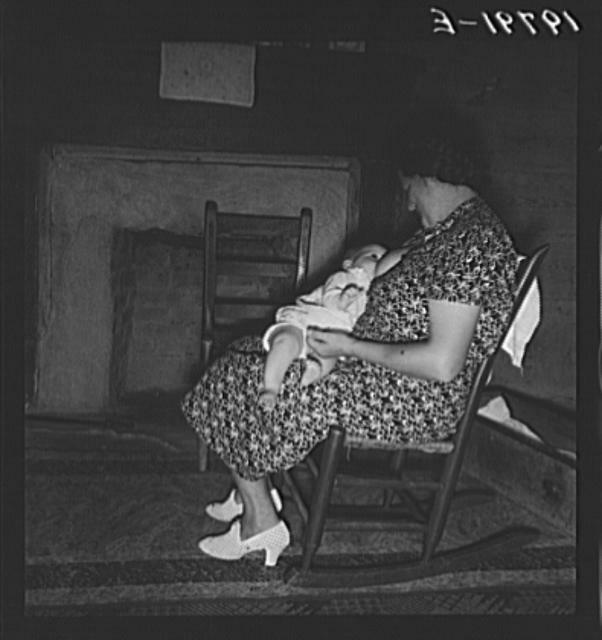 In this example, a Wake County mother stands in a doorway holding her baby with her “knee baby” beside her, looking out at Lange. 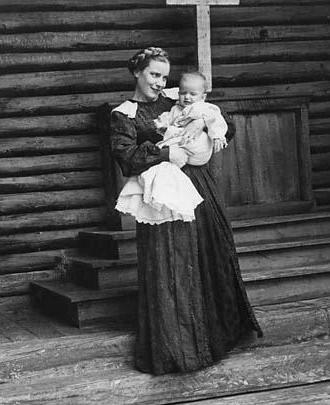 In Person County, Lange took this photo of a mother nursing her baby in between washing dishes and straightening up the house. The wife of a tobacco sharecropper, this mother likely wore her Sunday best to greet the photographer. What kinds of motherhood-related images and artifacts does your institution hold in the public trust? Have you ever tried to engage the community through a special exhibition or other public program incorporating this theme? Duke University preserves many of H. Lee Waters’ “Movies of Local People” (1936-1942). If you have photographs and film in your collections and are able to place a refrigerator/ freezer unit in your institution, then you can consider cold storage as a preservation method. Some artifacts–such as color photographs–should be frozen, while others–such as CDs and DVDs–are better off in refrigerated storage. See table 3 of the Image Permanence Institute’s Media Storage Quick Reference to determine the best temperature range for each material in your media collection. There is lots of good news and a little bad news about storing collections in a refrigerated unit. For more detailed information, see an article on the subject by Conservator Tim Vitale. Cold storage will increase the longevity of paper-based and film-based materials significantly. Polyethylene freezer bags will protect the object’s moisture content in a refrigerator/ freezer. Most conservators recommend double bagging. Objects should be packed within a moderate RH (30-50%) environment. Unlike with frozen foods, the formation of ice crystals is not a concern when freezing photographic media; there is no free water in these materials. Cold storage limits access to these collections. The necessary packaging and procedures will prevent collection browsing. Planning is necessary for access. Objects need several hours (4-12) to warm to room temperature while still sealed in bags. 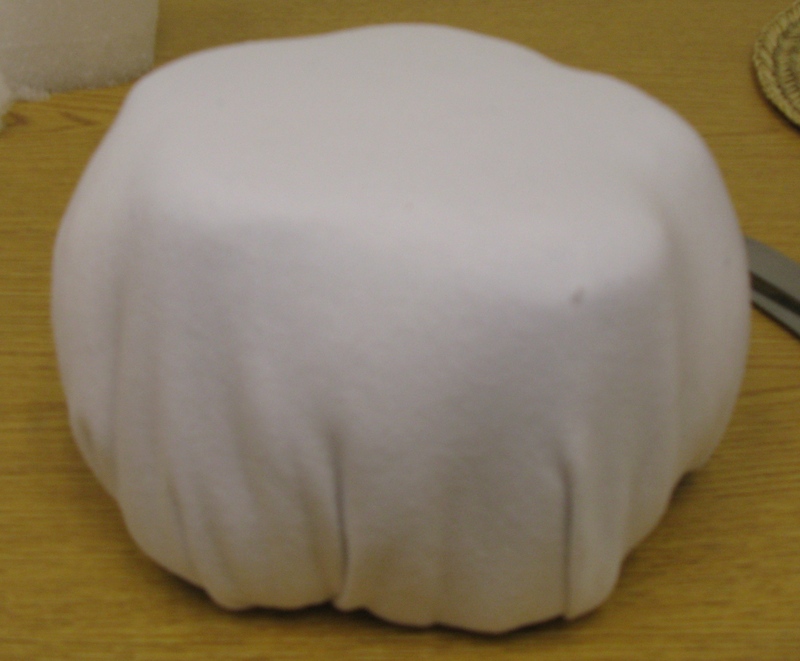 The safest warming method is to transition the bagged object gradually in a Styrofoam cooler. Thanks to Martha Battle Jackson, Curator for North Carolina’s State Historic Sites, for this guest post. Thanks also to Janis Wilkens, Registrar at the Levine Museum of the New South, for her insights. 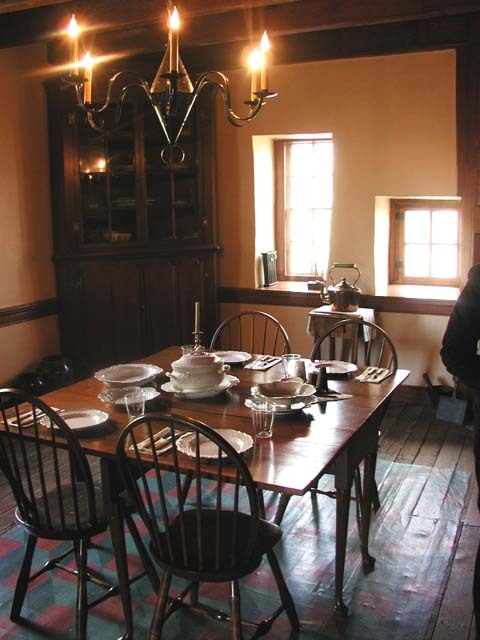 One of North Carolina’s Historic Sites is Duke Homestead, home of Washington Duke. Duke created a huge tobacco empire with his sons and later moved Trinity College to Durham. Trinity College is now Duke University. In addition to the Duke farmhouse, tobacco factory, and other outbuildings, the site has a large visitor center with exhibits on the history of tobacco production, from field to factory. 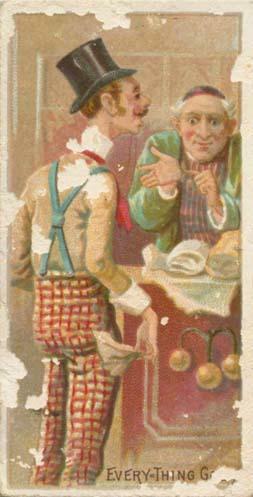 The Duke Homestead collections include a huge assortment of tobacco products, advertising, farm equipment, etc. We have stored these products, including cigarettes, plug tobacco, chewing tobacco, and smoking tobacco, for almost 40 years without any problems. In fact, a few years ago, I had a university entomologist visit the collections storage, and he was amazed at the lack of pests. We are very vigilant about checking incoming collections for pests and isolating any suspected items in polyethylene bags or using the freezer treatment to kill any pests. This tobacco insert reads “Packed in Duke’s Cigarettes” en verso and bears the marks of insect damage on the front face. Roaches or silverfish likely caused the losses. Although nicotine has pesticide properties, cured tobacco attracts some insects anyway. 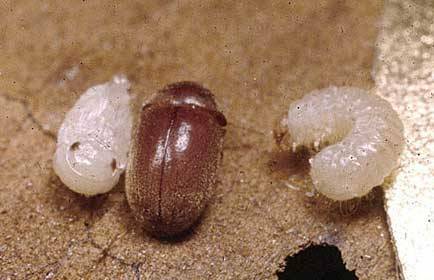 Cigarette beetles are pests to look out for in collections of tobacco products. Moreover, they will damage a range of collection materials including books and textiles. We store all of our cigarettes in their original packaging—paper wrappers, pasteboard boxes, and tins are the most prevalent ones. Most are stored in acid-free boxes, but some of our cigarette packs are stored in old library card catalog drawers lined with microfoam and acid-free paper. The white lining helps us see if there is any active infestation, and we check all drawers once or twice a year. Larger packs and boxes are stored in flat acid-free boxes. Most of our cigar boxes are empty, so those are packed into acid-free boxes and stored on shelves. Boxes with cigars are stored separately in acid-free boxes in another location, so we can monitor pests more easily. Again, those are checked once or twice a year. 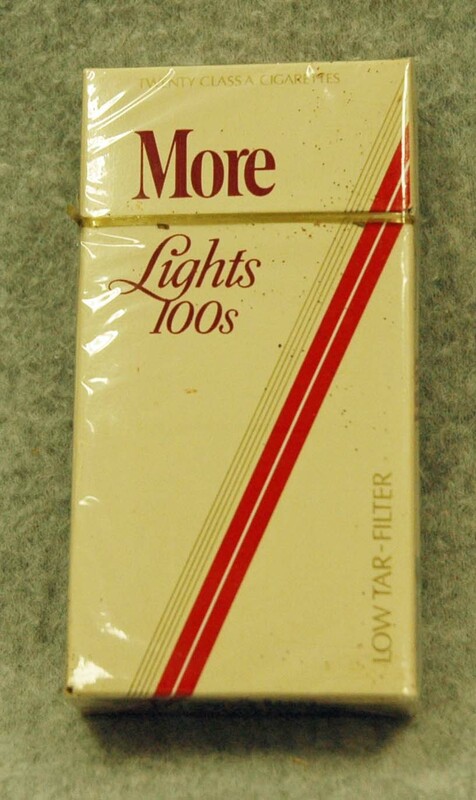 These two collection items–a pack of More cigarettes and a pair of Longfellow cigarettes–show tiny exit holes from cigarette beetle infestations. They came into the collection with this damage and have been stored isolated in polyethylene bags. The evidence of the beetles is often more visible than the insects are. Exit holes and small piles of tobacco dust/ frass near the artifact are tell-tale signs of beetle problems. In addition to practicing Integrated Pest Management, climate control is important in preventing problems. We also try to keep the humidity levels in the 45-55% range–sometimes difficult in the South!